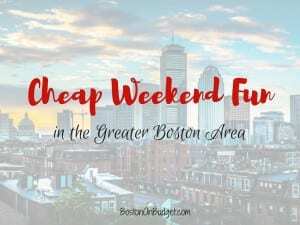 Cheap Weekend Fun in Boston for May 26-28, 2018! There’s so many fun things to do this extra long weekend in Boston for Memorial Day weekend. As always, please let me know in the comments below if I missed any of your favorite free events. Free Ferry Day: *Postponed, new date: Saturday, May 26, 2018. The Boston Harbor Islands return for the season this Saturday and you can take a FREE ferry to George’s Island or Spectacle Island to celebrate! First-come, first-serve. Memorial Day Open House at the MFA: Monday, May 28, 2018. Enjoy free admission all day at the Museum of Fine Arts in Boston for their annual Memorial Day Open House. Free Admission at the ICA: Monday, May 29, 2017. In honor of Memorial Day, the ICA is offering free admission to all to the art museum on Monday. Also, FREE admission for up to 2 adults per family when accompanied by children ages 12 and under on Saturday. MIT Museum: Sunday, May 27, 2018. The MIT Museum is free the last Sunday of each month, September to June. If you are looking for a Memorial Day Parade, Boston Central has a great list of Memorial Day parades around Boston and Massachusetts.